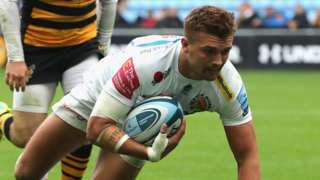 Exeter Chiefs pick up their second bonus-point win of the new Premiership season with a thrilling 42-31 victory at Wasps. "Unfortunately a legend has been lost," the family of Johnny Kingdom, 79, say in a statement. A390 Cornwall both ways severe accident, between A390 and B3275. A390 Cornwall - A390 Probus Bypass in Probus blocked and very slow traffic in both directions between Trewithen Roundabout and the B3275 junction, because of an accident involving three vehicles. The National Farmer's Union in Cornwall is trying to highlight the importance of agriculture to the local economy today. The NFU is showing consumers what goes on behind the farm gate with a promotional event at a farm in Manaccan on the Lizard. Fifty farm suppliers have been invited to Treworgie Farm along with vehicles, lorries, trucks, vans and tractors to show how many people rely on agriculture in Cornwall. A rescue operation is in progress after six sheep got stuck down the side of a cliff in Ilfracombe. Firefighters - including a specialist rescue team - and the RSPCA began the rescue attempt yesterday, but were unsuccessful. Crews returned this morning and, with the support of the coastguard, four sheep have now been successfully herded back up the cliff. The remaining two have been left in the care of the farmer and the RSPCA. Police want to identify and speak to two men following a serious assault in Plymouth. The victim, a 35-year-old man, sustained serious injuries in the assault, which took place at a bus shelter next to the Theatre Royal at about 03:05 on 30 June. In July, a 22-year-old man was arrested in connection with the incident and released under investigation pending further enquiries. Officers would like to speak to two further men (pictured) as they may have information vital to the investigation. Police are seeking a man who exposed himself to a lone female dog walker near Yelverton. The man asked the woman for the time, and when she turned around to reply the man was exposing himself. The woman, who is in her 50s, ignored the act and returned to her car to call the police. It happened at about 13:45 on 5 September near a car park on the Clearbrook road, just before the junction with the A386. The suspect was last seen near the woods next to the car park. He is described as white, in his mid-20s, of medium or stocky build and with short dark hair, parted at the side. An administrator has admitted stealing more than £30,000 from a newly-opened school in Cranbrook, east Devon. Ellen Chaplin carried out the fraud between May 2016 and April 2017 while working as a senior administrator for the Cranbrook Education Campus. She created false payments for staff, supply teachers, and a training company which she transferred into her own account by altering bank details. Chaplin, 24, who was living near Cranbrook at the time but now lives in Latchley, near Gunnislake, admitted 10 counts of fraud and abuse of a position of trust. Judge Paul Cook adjourned her case at Exeter Crown Court to 5 October, released her on bail, and ordered a probation pre-sentence report. There are currently 81 properties without power in the TR15 area of Redruth, Western Power Distribution has said. Engineers are working to fix the problem and say power should be restored by 17:00. 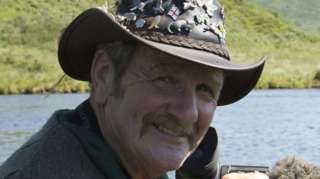 Wildlife presenter Johnny Kingdom has died following an accident on his land, his family has confirmed. The filmmaker, photographer and author - who specialised in his local area of Exmoor and north Devon - was 79. Police were called to a field near Wadham Cross in Knowstone, Devon, after reports a digger had rolled over at about 21:00 on Thursday. Emergency services attended and Mr Kingdom died at the scene. Unfortunately a legend has been lost. Johnny would want you all to continue with his love for Exmoor as you all meant so much to him. As the loving man himself would have said: 'Farewell to all you lovely people'. RIP 23/02/39- 06/09/18." M5 Devon southbound severe disruption, between J30 for Sidmouth Road J30 Exeter and J31 for A38. M5 Devon - One lane closed and slow traffic on M5 southbound between J30, Sidmouth (Exeter) and J31, A38 (Exminster), because of a lorry having a tyre changed. It's hoped a Brexit summit in Plymouth today will answer questions about what will happen in the South West after Britain leaves the EU. The summit has been organised by Plymouth Sutton and Devonport Labour MP Luke Pollard and involves speakers including Neil Parish, Conservative MP for Tiverton and Honiton, and Exeter's Labour MP Ben Bradshaw. 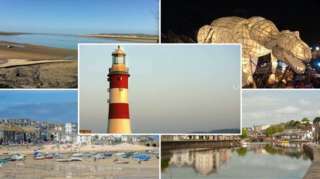 The main theme is "how prepared is Plymouth and the far South West?" The guests that are coming from right around the region are able to contribute to the questions we need some clarity on. They're the type of things that politicians like myself can take back to ministers and say 'this is what we need to know, because if you can't give us this information we simply can't prepare for Brexit', which means that the impact of it is going to be even bigger." Two people have been rescued after their motor cruiser ran aground on a beach near Porthleven. With the help of the Porthleven Cliff Rescue Team, lifeboat crews found the 22ft (7m) vessel just before 22:30 on Thursday. It was travelling from Plymouth to the Isle and Man. Despite difficult conditions and shallow water, they were able to tow it off the beach and back to safety at Newlyn Harbour. The boat's onboard VHF radio wasn't working, so they hadn't been able to call for help. Luckily, a member of the public spotted them and called the coastguard. A 79-year-old man has died after a digger rolled over in a field in Devon, police say. Emergency services were called to the field near Wadham Cross, Knowstone, at about 21:00 on 6 September. The man, who is said to be local, died at the scene. His next-of-kin have been informed and inquiries are ongoing. Health chiefs are advising the public to get up to date with the measles vaccine after a series of outbreaks across England. Offical NHS data shows that as many as 8,872 children born between April 2000 and March 2016 in Devon have not had the first dose of the MMR jab. As many as 13,196 children (21.2%) in the same age group might not have had the second dose by the time they turned five. There have been 13 reported cases of measles in Devon so far this year, up from seven during the same period last year, according to Public Health England. In the 35 weeks ending 2 September, 2,065 suspected cases of measles were reported to PHE across England and Wales, almost double the number for 2017. The majority of cases we are seeing are in teenagers and young adults who missed out on their MMR vaccine when they were children.This serves as an important reminder for parents to take up the offer of MMR vaccination for their children at one year of age and as a pre-school booster." A group of artists, writers and performers have started a new support group in Devon for creative mums. Mothers That Make was an idea created in London by a theatre producer who was struggling to balance motherhood and work. The initiative got Arts Council funding to allow women to share their experiences and support each others artistic hobbies or work. A new peer support hub has just opened in Exeter and the first rural group has started in Ivybridge. The groups allow mothers to bring their children along while they support each other. A gay pride mural has been defaced with homophobic graffiti again. The person - dubbed the "Midnight Marker" by locals - scrawled abusive messages across the rainbow wall at the Princess May Recreation Ground, Penzance, on Wednesday night. It's the second time the mural has been vandalised, just two weeks after it was completed by the youth group "Pride to Penzance". If it's going to keep happening, we're just going to keep re-painting the wall." The mural has been repainted for a second time. The windscreens of six police police cars were smashed in Newquay overnight. Police said they have arrested a person in connection with the damage.